Welcome to Goggin Rental! We are very happy you found our site and hope you will take a few moments to browse through our extensive inventory of both general rental equipment and party & event rental equipment to get a feel of what we carry that will help you with your projects and events. Goggin Rental has been providing general equipment rentals and party equipment rentals for the Greater Kalamazoo area for over 52 years. Our business philosophy is simply "One Call Rents it All." Not only can you pick rental equipment up at Goggin Rental, but we also offer delivery and pickup of both our general equipment and party equipment in the Greater Kalamazoo area and its surrounding areas, including but not limited to: Comstock, Galesburg, Augusta, Battle Creek, Richland, Portage, Mattawan, Schoolcraft, Vicksburg, and Oshtemo. 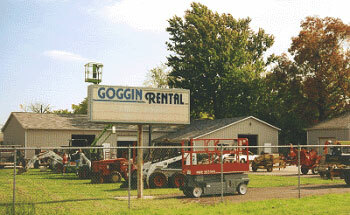 At Goggin Rental, we provide you a great selection of rental equipment, as well as great service and satisfaction. Our service includes keeping our commercial grade rental equipment in top operating condition, and showing you correct usage and operation of our rental equipment on site. An experienced member of our staff, teamed up with our efficient rental software, will help you select the right tool for your jobs, and get you on your way quickly with what you need to do your jobs quickly and efficiently. Goggin Rental offers a wide variety of homeowner and contractor equipment including well-known brand names such as Honda, Bil-Jax, Bobcat, Vermeer, Toro and many more. Here at Goggin Rental, you will find just the right tools for home improvement projects or for sprucing up your lawn no matter what the season. When your projects are complete and you’re ready to celebrate, we have great party rental items to help you host any special event. If you need help with the planning, we can help with that too! For your convenience, use our Web Quote System on our website to directly request a price quote for your party rental or equipment rental. It is easy to use and a Customer Service Expert will contact you personally within 24 business hours of your request; of course feel free to call anytime. If you are interested in renting equipment, purchasing used equipment, or looking for party supplies for a special occasion in the Greater Kalamazoo area, Goggin Rental is the place for you!! !